Townhouse condo in a small and quiet complex. 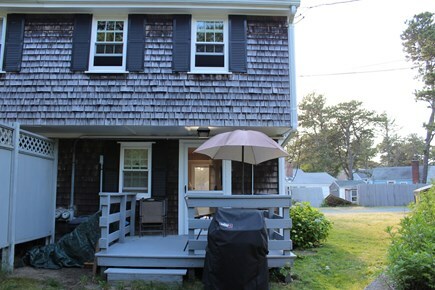 The condo is 1/2 mile to Sea Street Beach on the warm waters of Nantucket Sound. Bright open floor plan with the living room and kitchen on first floor. The bedrooms and bath are on the second floor. The living room has a queen size sofa bed, couch, TV, and DVD player. 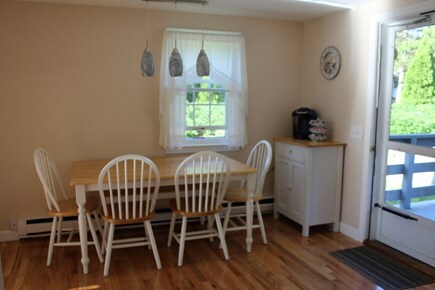 The kitchen is fully equipped and has a table and chairs that seats 6. Master bedroom has a queen size bed and TV. 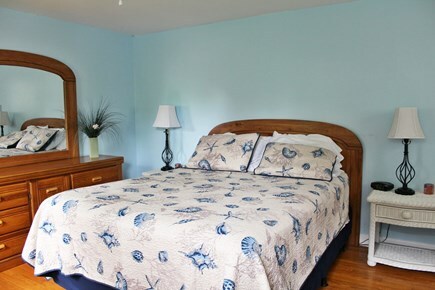 Another bedroom has two twin beds. A/C units are in the living room and master bedroom for those hot days and nights of summer and electric fireplace in the living room with heat throughout condo for those cool days and nights of the fall. Ceiling fans are located in both bedrooms. Fans are also provided. Deck with gas grill and furniture. 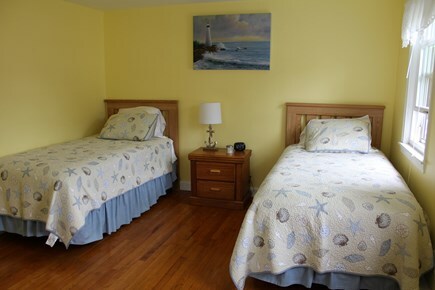 Walking distance to great beaches, restaurants, ice cream shops, miniture golf, bakery, bars, and convenience store. Short drive to more great beaches and restaurants, shopping, day spas, night clubs, bars, dog parks, bike and nature trails, parks, churches, libraries, golf courses, drama and movie theaters, kayak rentals, bumper boats, water sports, fishing, and grocery store.The condo is conviently located to many things the Cape has to offer. 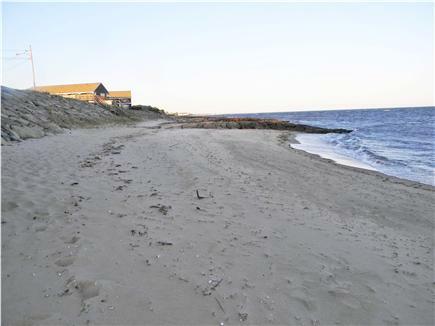 There are 19 public beaches in Dennis, 9 of which are 1/2 mile to about 2 miles from the condo, including West Dennis Beach. The Cape Cod Bike Trail is less than 5 minute drive (can also bike there from the condo) that runs from Dennis to Wellfleet. The Cape Playhouse is about a 10 minute drive. The playhouse is America's oldest professional summer theater and is often referred to as the ''birthplace of the stars''. Enjoy a free band concert on the Village Green in Dennis. Go to the next town over to Harwich to pick up a ferry for a trip to Nantucket or a tour near Monomoy Island for a seabird and seal watch. Want to go to Martha's Vinyard? Take about a 25-30 minute car ride to Hyannis where you can pick up the ferry to go to Martha's Vinyard and/or Nantucket. The Cape Cod Train is also in Hyannis. Enjoy a scenic ride that runs from Hyannis to the Cape Cod Canal. They also offer train rides for brunches, luncheons, family dinners, and elegant dinners as well. A trip to the Cape would not be complete without a whale watch. 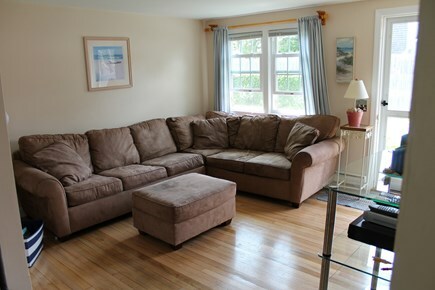 The condo is centerally located to leave out of Hyannis or Provincetown for the whale watch. The Cape Cod Baseball League is the premier amateur baseball league in the nation. Many MLB players have played in this league. There are teams from Wareham to Orleans. 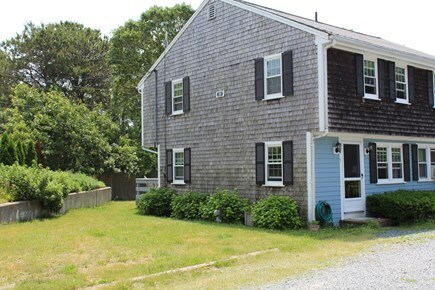 There are 6 fields that are a 10-30 minute drive from the condo in Yarmouth, Harwich, Chatham, Orleans, Hyannis, and Brewster. This condo is on floors 1and 2 of 2. I was pleased with this rental. The first thing I noticed was how clean it was. 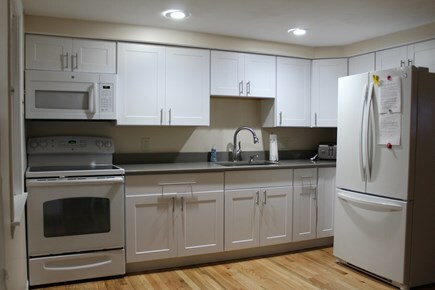 The kitchen had recently been remodeled and the unit was well stocked including linens and towels. The beds were comfortable. The location was convenient to the beaches and other towns. Karen was helpful and was quick to respond to any questions. I would recommend this rental. We had a great stay on the Cape for our annual trip! The townhouse was clean, and it made our trip so much easier that linens and bath towels were provided. We even forgot to pack a pack and play for our one year old, but Karen had a blow up air mattress that worked out perfectly for him. Location leaves you close to everything. Would stay here again. I had a great time exploring the cape this year. Found lots of great shells and rode a few new bike trails. Thank you. We had a great time. Thanks !!! Memories were created here during this week. What a wonderful condo---so clean and so cozy and made us feel right at home. the location is great. We walked and biked to the beaches. We also took the ferry to Martha's Vineyard. Thanks again for letting us stay in your home. Great place, great location, very quiet. Completely enjoyable !!!!! Ideal location !!!!!! Quiet, relaxing enviornment and so clean. Thanks for helping to make it a great week for my friends and I. Thanks once again for the great accommodations.